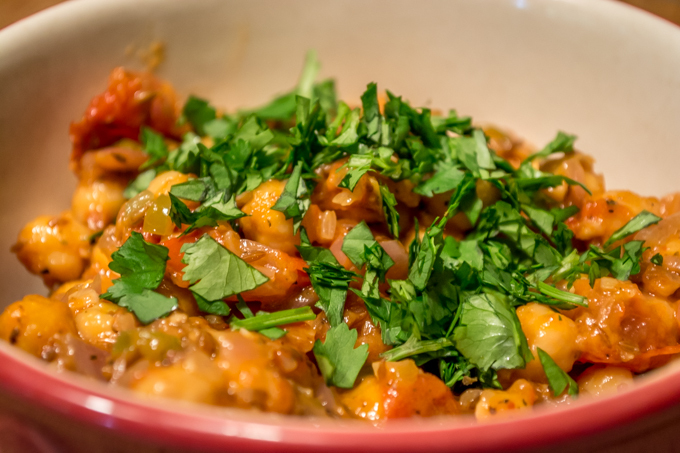 We cook a lot of legume-based curries as side dishes. While they seem complicated at first, due to the sometimes intricate spice combinations, they are really pretty simple, quick to cook and follow some familiar patterns. 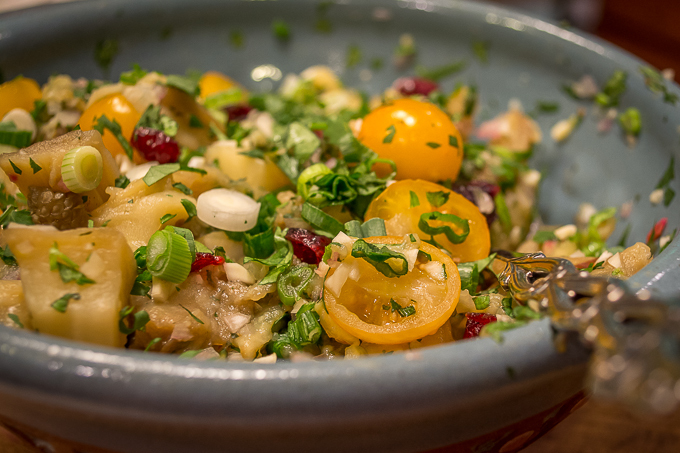 This dish is no exception, although it originates in the Middle East and is referred to as a salad in the reference cook book Silk Road Cooking: A Vegetarian Journey . The spices, in this case cumin and asafetida, are toasted in oil over reasonably high heat, the remaining ingredients are combined, and the whole thing gets simmered to combine the flavors. Not much could be simpler, especially if you already have the cooked legumes handy or are using canned ones. As I have probably mentioned, cooking with legumes is greatly facilitated by using a pressure cooker. Modern pressure cookers are a really safe and efficient way to cook. You deserve one. One bite of this dish lets you know what makes it special. Hell, one sniff of the air wafting out of the house would tell you; it’s all about the cumin. It would be unusual to find a dish that is more aggressively spiced with cumin, and if you are not ready for the heat that comes along for the ride, it is surprising, especially since there is a chili in there for backup. This dish is not about balance…. This chunky, fresh-tasting salad comes dangerously close to being a salsa. It boasts the bright, clean flavors of scallions, citrus, and mint. This is backed by the smooth and somewhat smoky taste of the broiled eggplant. The pomegranate reduction adds a unique sharpness to round out the dish and provide even more depth. This is a really versatile salad that will be right at home with a variety of meat dishes. In our case, this meat was smoked chicken. Preparing this dish is going to take a bit of time on your part, because it simply takes time to broil, peel and chop the eggplant. It is, however, well worth the time investment, as you will end up with a richly flavored side that is really quite special. Nothing else about this dish is particularly difficult, and after you make it once, you will probably be quite comfortable adjusting the ingredients to customize the flavor. For example, in the version that we prepare, we use less walnuts and also prefer dried cranberries instead of pomegranate seeds. Try either the version below or the original that Suzanne Husseini published in her book, Modern Flavors of Arabia . This is an excellent book if you are interested in exploring this type of cuisine or simply like the blend of flavors represented by this dish….